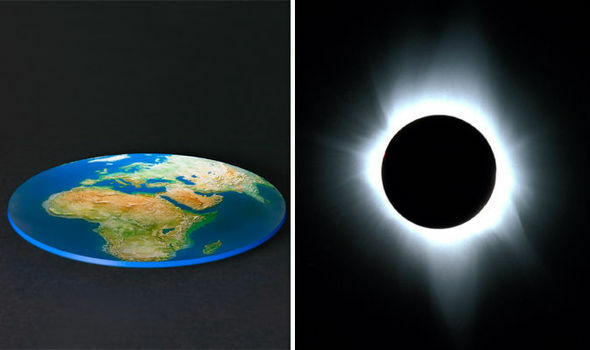 A total solar eclipse occurs when the moon is at a close enough point to the Earth and simultaneously crosses the path of the sun, causing it to cast a shadow over large parts of Earth’s surface, with the US getting the best view this time around. All perfectly reasonable if you believe that the Earth, moon and sun are round. However, some conspiracy theorists believe that the Earth is flat and is part of a big international governmental cover up. If the Earth is flat, then it would not orbit the sun and the moon would not orbit our planet, both would just appear in our skies, essentially orbiting us. So how do ‘Flat Earthers’, as they are known, explain the impending solar eclipse? The conspiracy theorists have taken to Reddit to detail how they believe the natural phenomenon occurs. Some believe the sun and the moon are simply holograms projected in the sky, to convince the masses that we are part of the universe which we are led to believe we are in. Sometimes, these holograms need updates, flat earthers say. Another explanation is that the moon is actually much larger than the sun – in reality the sun’s diameter is 400 times larger than the moon’s – and it crosses in front of it to turn the day black.